The performative installation series 'Transatlantic Transformations' involves the transformation of beach stones from the Île d'Oleron in France into bronze/ice sculptures. Sculpturer Aimée Xenou will spend the first half of 2010 as a visiting artist at Mount Holyoke College in Massachusetts and ‘Transatlantic Transformations’ accompanies her travels. As the sculptures travel transatlantic they will be shown in four different local settings during this journey, including Reykjavik, Iceland and Cape Breton Island, Canada. Challenging the Greek derivation of the word geography as describing or writing about the earth, in 'transatlantic transformations' Aimée Xenou teams with different local artists to create a material connection between two points on a map that are located at the same latitude, but are transatlantic to each other (the Île d'Oleron in France & Cape Breton Island in Canada). While doing so, Aimée branches off the latitude in the midst of her transatlantic journey in order to leave the ordering system of latitudes behind and to grasp and include stories that are collected while being side-tracked in Reykjavik. Aimée Xenou finds her entrance to all the material geographical places involved in ‘Transatlantic Transformations’ not through information that is given on maps as such, but through landscape-specific materials, such as the beach stones and ice, as well as the narrations of people who call these landscapes their places of belonging. During the conceptualization of this project, the artist pays specific attention to language inhabiting the power to produce and reproduce 'spaces' through practices of naming and, concomitantly, value attribution. In this sense, the artist currently tries to expand her own lingual space of belonging by attempting to learn some Icelandic. The material components of the event, that is the bronze sculptures formed after the beach stones that were found, will be frozen in blocks of ice for the installation in Reykjavik. During the installation two speakers will invite the audience into a narration which will spin a web between the geographical origin of the stones (the Island of Oleron in France), the place in which the transformation of the stones took place (the south of Germany), then Reykjavik, and then the final destination of Cape Breton Island in Canada. The show in Iceland will be held 'between' the languages of Icelandic and English, with two speakers and one singer being involved. Once having arrived at the transatlantic latitude destination of Cape Breton Island (Canada), it is planned for the bronze sculptures to be released into the sea in order for them to (theoretically and wishfully) be carried back in their transformed materiality to the French Island they came from, hopefully floating by Iceland. About her artistic approach the artist says: As a culturally-nomadic artist, I am continuously exposed to new circumstances as I geographically and disciplinarily relocate myself and pull myself out of spaces that are characterized by my knowledge of the language spoken and my familiarity with the surroundings. My art work emerges out of an interplay with the various cultural settings in which it takes place and is subject to ongoing negotiation and reflection. This approach impacts on how modes of sense-making, from an ever shifting point of view, materialise in my art. My curiosity and social interaction with those around me direct me to different materials. In the Icelandic ‘Transatlantic Transformations’ event I will be working with materials I have never worked with before, which are bronze and ice, however, I will also perform with the local artist Kjartan Rolf Árnason and the local singer Margrét Pálsdóttir, both of whom I so far have not met in person. Since 2009, the artist works under the name of Aimée Xenou. Aimée was a visiting artist at the Cyprus College of Art in Limassol (now in Larnaca) in 2004 and Lempa, Cyprus in 2005. She has also been an invited speaker at art/science interface events such as the Unnatural Selection Darwin Summer Symposium in Shrewsbury, UK in 2006. Her teaching experience is in Feminist Art History, Art and the Body, as well as the Art/Science Interface. Currently she is contributing a chapter to an anthology titled ‘Der intersektionelle Raum Gechlechterforschung und Medienkunst an den Achsen der Ungleichheit einer Stadt’ (The Intersectional Space: Gender Studies and Media Art on the Axes of a City's Inequalities). Aimée holds degrees in sculpturing, cultural studies and social sciences. 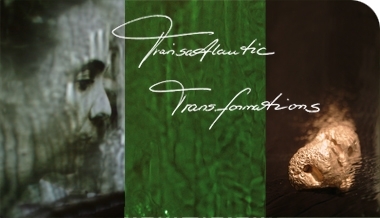 Transatlantic Transformations is her sculpturing diploma show.